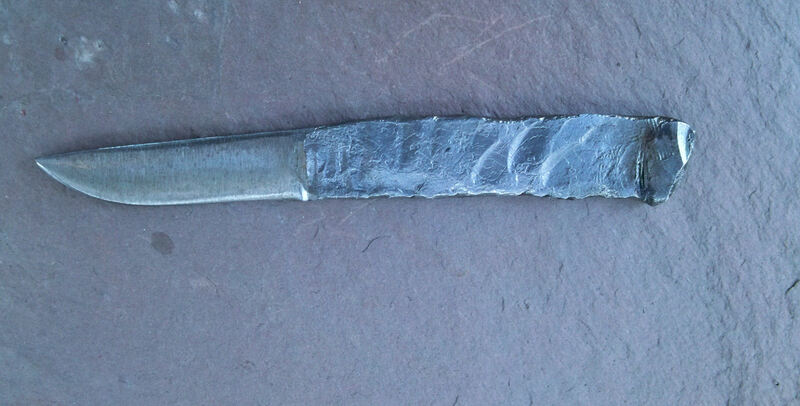 Forged iron Rams Head Athame. 42RC. Forged 40 grade Rebar. Very well hardened. Currently used as a utility knife. Knives like the ones shown above are really why I stay creative and inspired to be a blacksmith. I love to dive into doing solely artistic pieces to refresh my mind and get inspired to keep working and progressing. If you ever feel trapped in by conventional knife making I do urge you to grab a slab of iron and forge something just for the enjoyment and creative process. The Rebar utility knife I simply made for myself as a leather working tool, I got lucky with a piece of HC 40 grade and its turned into a great little knife I use all the time and its holds its edge as good as any store bought knife I have had. Stay inspired and keep pushing your creative boundaries. This entry was posted on September 6, 2011 by .. It was filed under Knife making-Blacksmithing and was tagged with 40 grade rebar, athames, creative knives, dagger blades, daggers, display knives, forged iron, forged steel, hand forged knives, iron knives, Knife making, knives, making knives, pagan, railroad spike knife, rebar dagger, Rebar Knife, rebar utility knife.